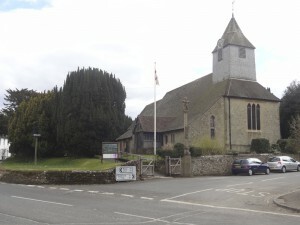 Rogate Church, dedicated to St. Bartholomew, lies at the centre of the village. There may have been a church in Rogate in Anglo-Saxon times, and there must have been a church in existence in AD 1100. The unbroken list of Vicars goes back to 1222. The oldest visible portion of the present building is the round Norman arch at the east end of the north arcade in the nave (the smallest of the three). It was built in about 1150, while the other arches in the nave arcades (with the exception of the two western ones which were added in 1874), date from the 13th century. There is work from the 13th, 14th and 15th centuries in the Chancel and Sanctuary. Until 1874 the timber tower, which is dated about 1330, stood between what are now the two central arches of the nave arcades. In that year the church, which had become very dilapidated and indeed dangerous, was extensively rebuilt and extended westwards – though the general external character of the old building was sympathetically preserved. The timber tower was pulled down piece by piece, and rebuilt in its present position within a new stone casing at the base. The tower is the outstanding architectural feature of the church, and something of the splendour of the ancient Wealden oaks can be gauged from the size of its timbers. Some memorial tablets in the tower predate its re-erection, having been removed for the sanctuary east wall – ancient pictures show their original position. After the tower had been dismantled, a wall-painting which had been hidden by one of the uprights was revealed above the centre pillar of the north arcade of the nave. Paintings in this position are often of St. Christopher, but those who saw this one before it faded believed that it was the Good Shepherd. Only the feet can now faintly be seen above the capital of the pillar. The Vestry was added in 1908. This date is carved in the stonework on the inside of the vestry north wall between the window and the external door. It was funded by a then churchwarden, a former resident of Clayton Court at Hill Brow, whose daughter Cicily Elger has the distinction of being the only female, and civilian, recorded on the war memorial. She had nursed WW1 casualties at the house when it was donated as a temporary hospital, and was much loved for her work. Of interest are the stained glass windows. That of St. Michael and St. George in the Sanctuary, of St. Catherine in the chapel, and the bright, modern window in the south west corner, are dedicated to former clergy. The west window in the tower is known as a ‘Jesse Window’, as it depicts the line of succession of Jesus from ‘the stem of Jesse’. It was placed by Henry Allen Rolls, of Rolls Royce fame. The east window was placed in memory of Charles Wyndham (b.1796 d.1866) and his wife who died in 1873, by their children. It is thus likely to have been installed as part of the major refurbishment in 1874. There is a tradition that the window was taken from the ruins of Durford Abbey. The very fine two-manual pipe organ was installed in its present position in 1908, and has recently been extensively refurbished. It is deemed to be of very good quality. For the benefit of future generations, on-going refurbishment of ancient buildings is vital. Of late, in a costly programme of works, the tower has been re-shingled, the chancel and nave roofs have been re-tiled, and to meet modern expectations a toilet has been installed in the vestry.